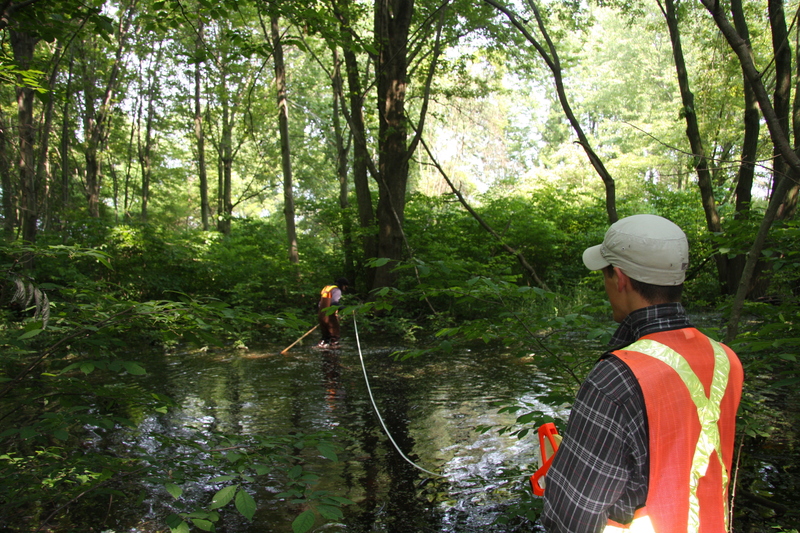 I just returned from a week of aquatic sampling at Point Pelee National Park and have much to share. The peninsula that is Point Pelee is the most southern part of Canada and it is revered as one of the best spots in North America to observe the spring migration of songbirds. The park itself exists largely due to the efforts of W.E. Saunders who arrived at Point Pelee in 1882 with the intention of duck hunting. However, when he saw the abundance of bird species in the area he quickly lost his interest in hunting. With the help of his friends, Saunders would go on to establish the Great Lakes Ornithological Club (GLOC). One of its founding members was Percy Taverner who became Canada’s first Dominion Ornithologist. 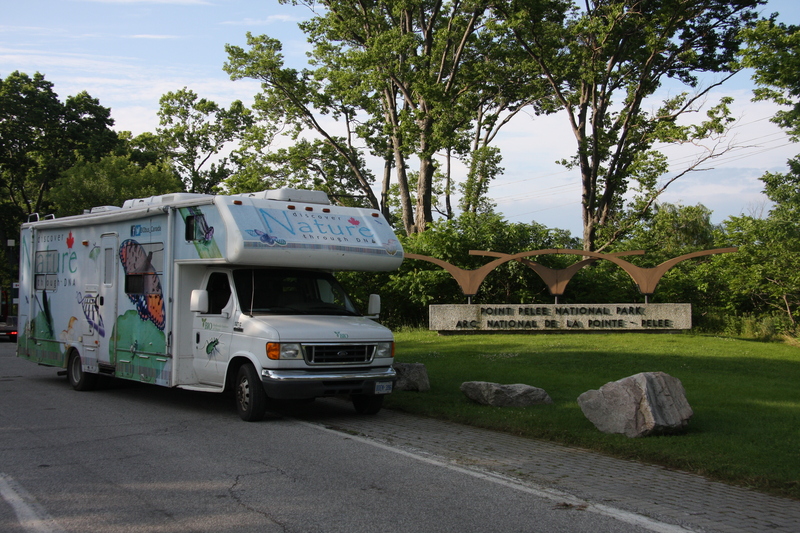 Taverner forwarded a proposal to the Federal Commission of Conservation that Point Pelee be granted national park status. Over the next few years, Saunders, Taverner, and the rest of the GLOC reached out to avid ornithologists and conservationists alike. In 1918, the amassed local support along with the ornithological evidence provided by the GLOC convinced the Federal Commission and Point Pelee was declared a National Park. When we were driving into Point Pelee I was excited to see numerous signs advertising spider control and removal. With this many signs for spider control, I was thinking that there must be tons and tons of spiders in the area – great news for a novice arachnologist! Unfortunately, my hopes were dashed when I discovered that there wasn’t a problem with spiders so much as there was with harvestmen. They are two completely different organisms and I figured that this would be a great time to explain the difference between spiders and harvestmen. 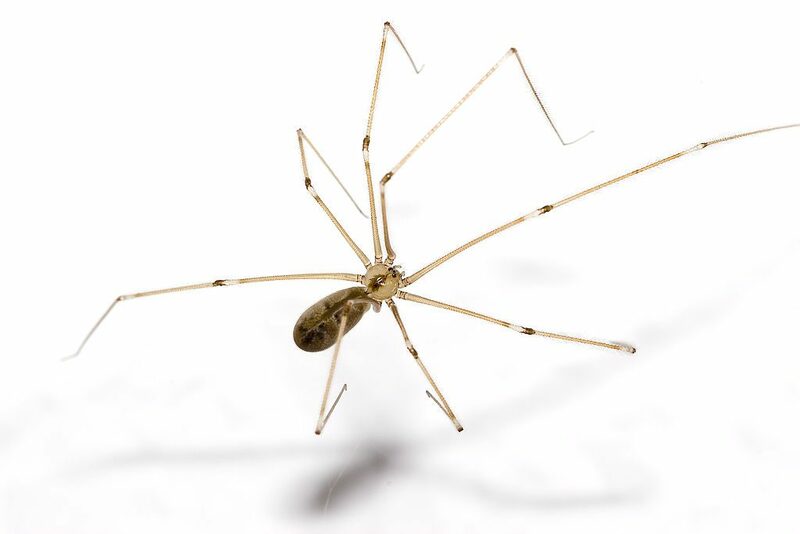 The confusion stems from the fact that the common name daddy-longlegs is applied to both harvestmen and spiders of the family Pholcidae. Although both are in the same class of Arachnida, spiders are members of the order Araneae while harvestmen belong to the order Opiliones. That may be a little too technical, so here are some easy ways to tell the difference between the two. First off, the body of a harvestman appears to be one continuous segment whereas spiders have a clearly defined abdomen and cephalothorax. Secondly, harvestmen have two eyes while spiders can have anywhere from zero to eight eyes. 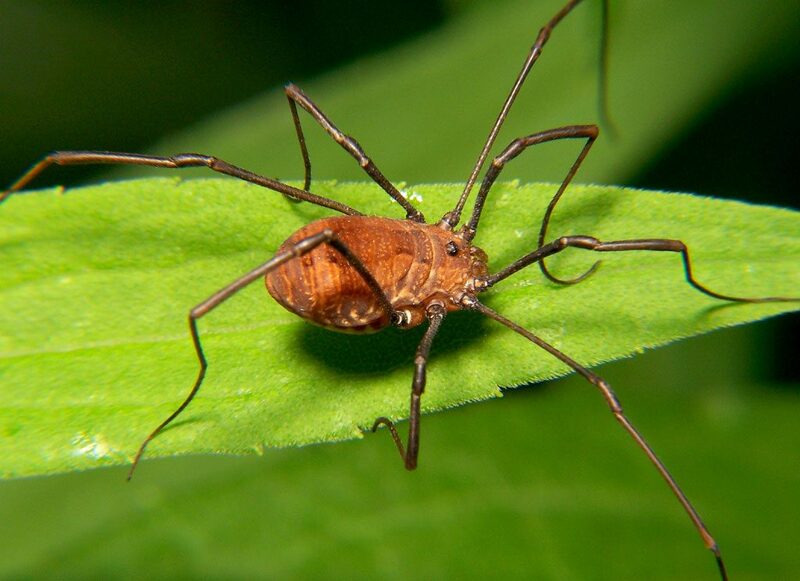 Thirdly, harvestmen lack silk glands and unlike spiders, cannot build webs. The last easy way to see the difference is that harvestmen lack fangs and therefore cannot bite. As we all know, spiders have fangs and can bite their prey or anyone that disturbs them too much. A genuine daddy long-legs spider (order: Araneae, family: Pholcidae https://en.wikipedia.org/wiki/Pholcidae). 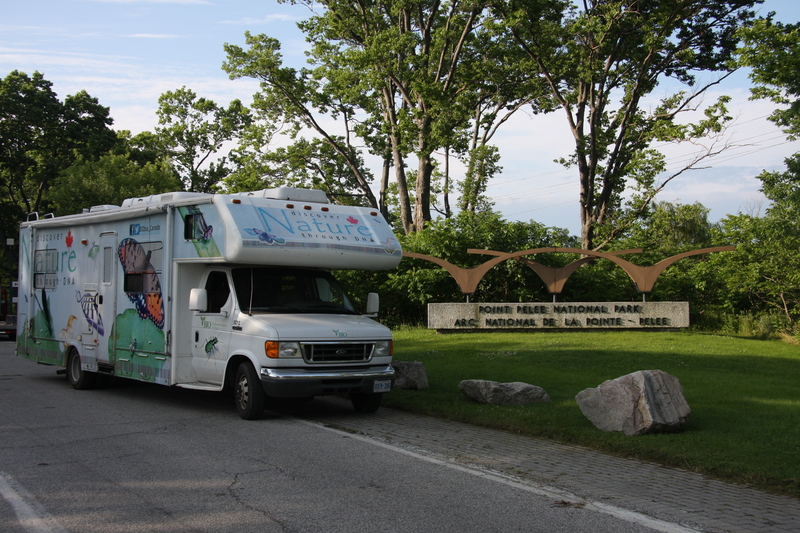 As I mentioned at the start of this blog, the BIObus team was at Point Pelee to do some aquatic sampling. We were collecting aquatic invertebrates and one of the methods we used is called kick and sweep collecting. To use this method, one team member wades out into the water with a D-shaped net. This is easier said than done as the wetlands we sample are usually full of squishy organic matter or stiff woody debris that can easily trip us up. Once the collector has waded out far enough, they walk backwards with the net in front of their shins, trying to kick up the tiny aquatic invertebrates as they go. I’ve gone a step further and actively dance when I am doing this method of collecting. Field work can be tough and sometimes you just need to enjoy the little things. Measuring how far Connor goes into the water. Don’t fall Connor! Welcome back readers, last time I shared a side of my passion for nature and biodiversity — the out-side — but what about the inside? For the past month and a bit, I have been redesigning the BIObus blog, and although I may not spend time outdoors while on the job, I still get a taste of the organic character of nature — through my code. 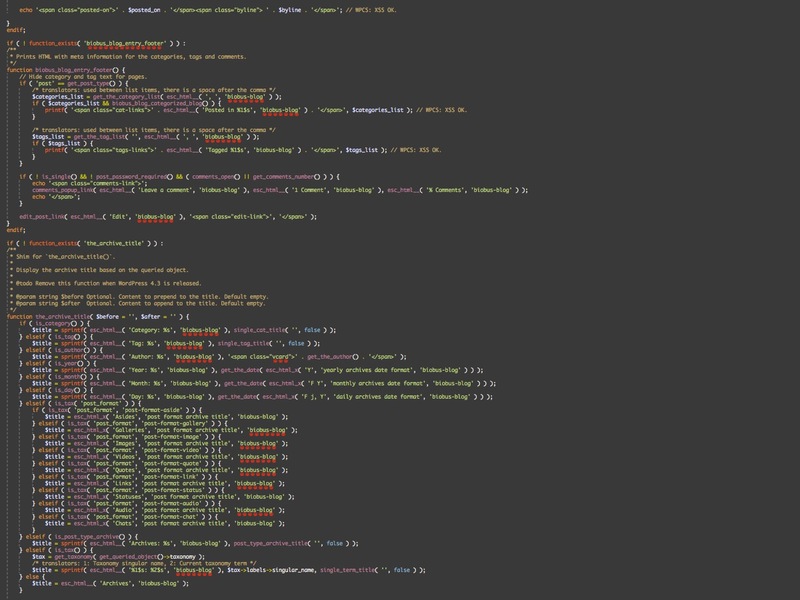 Structurally, code ebbs and flows like a shoreline, and so do my ideas. A colour scheme keeps me organized and balanced, and I usually pick various shades and hues to distinguish between the components of the language, as one would observe in the various biological components of their specimen. Simplicity on the surface, but complex underneath it. With any organism, what you see is not what you get. Body parts are defined by the biological code, the DNA, and the same goes for a website. I blindly build the appearance of the site and, until compiled, I have no idea what the “DNA” of the website will produce exactly. On the surface of any website it may seem simple, but there is always an element of complexity which underlies it, and another element of complexity which underlies that, and so on! 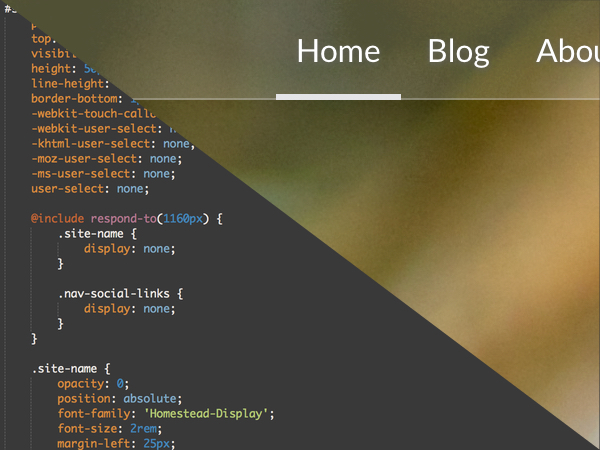 Every detail is accounted for, every pixel defined… and of course there are mistakes! 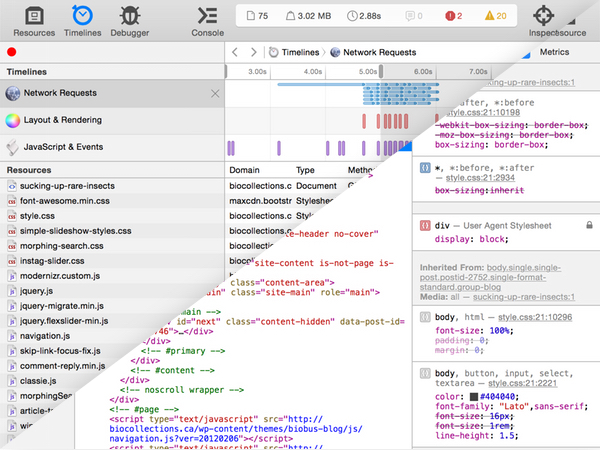 Everybody makes mistakes, but trust me, web development has an uncanny amount mistakes, codenamed “bugs!” I regularly find myself opening up the debugger to find a multitude of errors. Like a trap, you never know what you’re going to get until you look inside. Generally, a good place to start is by inspecting what looks wrong, similar to putting it under the microscope, and with experience and a good eye you can pick out what’s throwing things out of balance. Other times, it takes a lot of patience and luck, because code in one location can influence code in other locations. Like a spider’s web, every element on the page is interconnected… maybe that’s why they call it the World Wide Web!